We are currently busy hunting down bugs. While the physics test are still running, we collect bug reports and fix them. 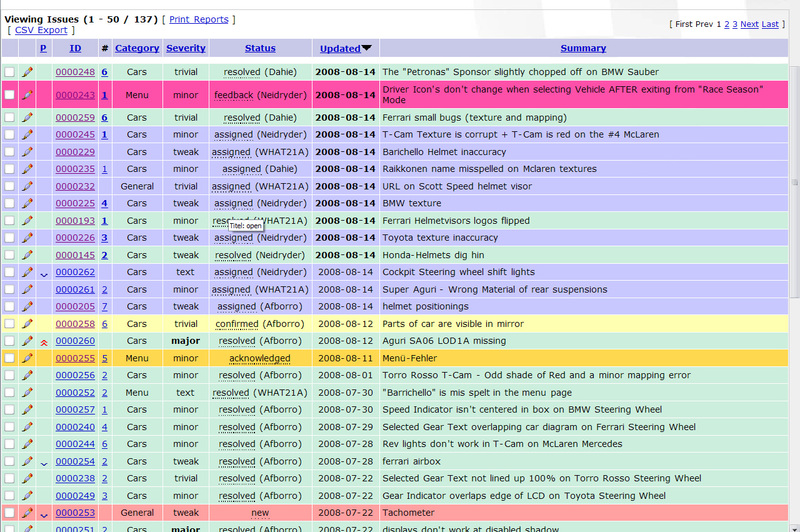 Just to give you a small sense of this, here a screenshot of our today’s bug tracking screen. So with more than 100 liveries (or is it 150?) and trackvariants, there is a lot of potential for bugs and we put a lot of effort in getting them. Damn guys i wish you luck to find them all and to fix them all. wow, you’re working with Mantis, professional!! if you need more beta testers, just mail. It would be great not to be betatester ourselves, when the mod will be released! Thank you for your hard work! Thanks for all this hard work guys! Guys, are you going to release trackpack? Or we have to use our own? There wont be a trackpack, all tracks which are needed can be downloaded in the web. We did it the other way round, some time ago, we asked for a long and complete list of which tracks to consider and support. We have most of this tracks during testing and the mod will support them. Of course what we can’t do is fix bugs, that are provoked by the track. I don’t know if there are anything, but if the track is buggy, it’s up to the author to fix this. There is a file in the mod that specifies the tracks we were aware of, used to specify what upgrades should be used for each track, so that will tell you. It lives in each of the Team folders. That is not a guarantee however they all work well, given what Dahie already. But we wont recommend preferences as such in our manual, or at least, nothing like has been discussed so far. Each of us here sometimes have different preferences when i comes to that anyway. And good luck as well for the 1994 mod as soon as you can get back on it.